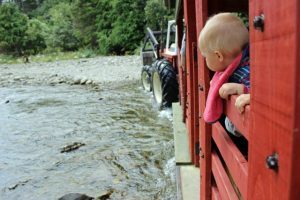 A popular destination for Wellington families as a day trip, especially on sunny weekends and during the school holidays, this place has a range of farmyard animals, in more natural settings than your average zoo. The best thing though is that the kids can interact with the animals if you pick up a bag of food on your way in ($3) or bring apples, carrots or bread from home. Some of them like to be stroked/patted. Animals include horses, kunekune, deer, native birds and trout and eels. See here for a map of Staglands. It’s beautiful when the sun is shining but can also be enjoyed in light rain (wear raincoats and gumboots). In winter, make sure you leave time for a visit to the cafe at the end of your visit to warm up next to the fire! Also in cooler months, look out for marshmallows on sale in the ticket office, which can be toasted on the campfire by The Barn. Another highlight for kids is that at the weekend, public and school holidays, weather permitting, they offer free tractor-trailer rides between 11.30 – 3.30pm. There’s an old Land Rover and Tractor for climbing on, as well as The Old Bush Settlement to explore plus free lunchtime feeding tours. You can also pick up activity sheets to either take home, keep kids entertained in the cafe or in the case of the treasure hunt one, to do as you go around. As well as the onsite cafe, there is also a ‘barn’ where families can go to have a sheltered BYO picnic or use the free BBQs, if it hasn’t been privately hired. Alternatively visitors can use the free BBQ available on the BBQ deck adjacent to The Café. For the most part, Staglands is out of mobile phone reception, so relax and enjoy this family time with the animals without being disturbed by the outside world! Address: 2362 Akatarawa Valley, Upper Hutt, Wellington. Staglands can be accessed via SH1 and SH2. The Akatarawa Road is very windy – worth noting if you have a kid prone to being travel sick or if you’re a nervous driver on rural roads. It’s approximately 16km of windy road from the SH2 turn off or 18km of windy road from the SH1 turn off. Open: daily 9.30am – 5pm (closed Christmas Day). Price: Adults (17 years+) $24, Kids $12 (4-16 years old), 3 years and under FREE. Family Pass $72 (2A+3K).